Not legit. Dial has been created and retrofitted. Thanks for the info! The seller is located in Russia according to the mailing label on previous packages received from him. That would make the export part of what you said a little suspicious. And I have heard about the whole transitional period making things a little tricky to date some of these watches. I am intrigued by the first one because it is an amphibian, and the second one because of the different case back. If both seem legit enough, maybe I just get both lol! Dub Rubb - the second example, a Komandirskie, has a caseback usually associated with export. The first model, an Amphibian, has the movement marked SU but no "made in" on the dial. I respectfully disagree with Neruda and would classify both these watches as "Generalskie" -- at least, this dial type is most commonly associated with them. A Generalskie can be thought of as an automatic Komandirskie. As such, it should have a chromed case (not steel), a painted bezel (not lumed), a case-back like so or like so (no Amphibian writing), and a simple/straight hour hand (not arrow). Here are some examples of Generalskies, including the dial variation which interests you. These examples come from my collection and another respected collector here (I'm sorry, I forget who). If I am correct, then the first watch you present is not fully original. 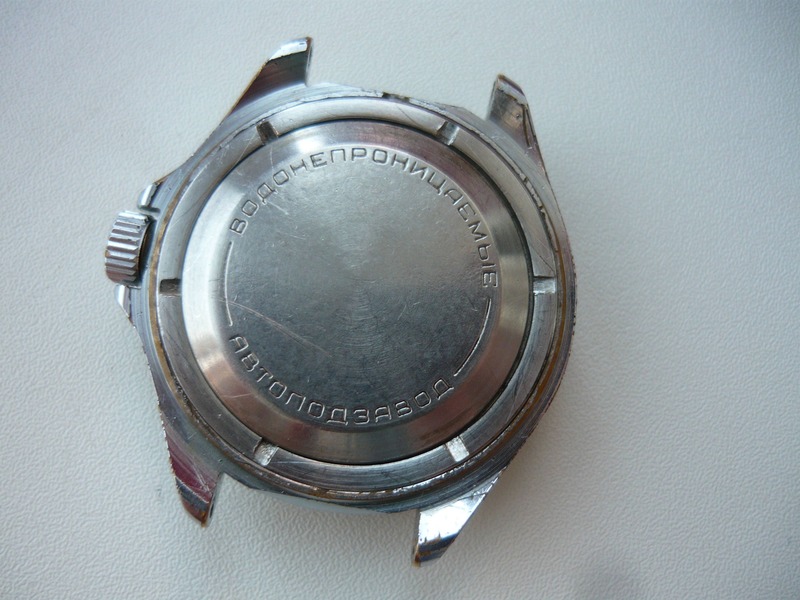 That or Amphibians actually had their own version of this "Vostok" dial that I was not aware of. The second watch looks like a proper Generalskie and would make a nice purchase, in my opinion. The only question mark for me is that tan dot at the top of the bezel? Last edited by mroatman; September 20th, 2017 at 21:11. ^Oh, and I think the export case back is a-okay for a Generalskie. A quick google reveals that the same seller has two other "rocket" models (one for sale, the other sold) both in what I believe are Amphibian cases. Of course, all three may be incorrect - dials can easily be switched. But if (a big if, if you like) they are genuine, then it does suggest to me at least that the dial was used in Amphibians. caseback will normally have two fixing lugs. The case will normally be steel, and not show wear through to chrome. Then a less than dogmatic look at the hands - the hour hand should usually be an arrow, and the crown which will usually be flat rather than domed. All three examples tick the majority of boxes - only the last has Komandirskie hands, but this is not a categorical reason for dismissal. In practical terms the difference between a Komandirskie and an Amphibian is water-resistance - but also I imagine cost. I can't see why Vostok would make an Amphibian only to sell it off as a cheaper model. As to the second model, I agree with Mroatman that a more precise name for the model might be Generalskie. However in this case I am using Komandirskie more generically, maybe I shouldn't! Vostok invented several names to market their Komandirskies. There are, for example, Artillery-skies and Cavalry-skies for the would-be soldier or Admiral-skies for the aspiring seaman. Some, such as the automatic Generalskie, have specific characteristics but others seem to be no more than a name on the dial. I've seen quite a lot of export casebacks sold out of former Soviet countries, so obviously a lot never made it across the border. I also think that many citizens of the USSR believed export products were higher quality - so I suspect this (mis)conception was sometimes exploited for domestic sales. There are, for example, Artillery-skies and Cavalry-skies for the would-be soldier or Admiral-skies for the aspiring seaman. Some, such as the automatic Generalskie, have specific characteristics but others seem to be no more than a name on the dial. As far as I am aware, Chistopol produced only four authentic USSR-era "skies": Komandirskie, Generalskie, Oficerskie, and Serjantskie. All have specific characteristics. The others you've noted are post-Soviet, I believe, and are therefore unlikely to follow the same (or any) rules. Neruda, kev80e and cptwalker like this. mroatman, kev80e and cptwalker like this. Just like your Amphibian orange rocket, I think all of these models were quite diffused in configurations. That's an Amphibian!? Oh geez, I have no idea why I had convinced myself that case was chromed. Looks like I have some website reorganization to do. So, only one legit case-type for Generalskie...? Is it?! I was taking a guess, but I didn't think the round case Komandirskie dated back that far.